Do you want to experience Led Zeppelin's music performed on the live stage the way you hear them on records? 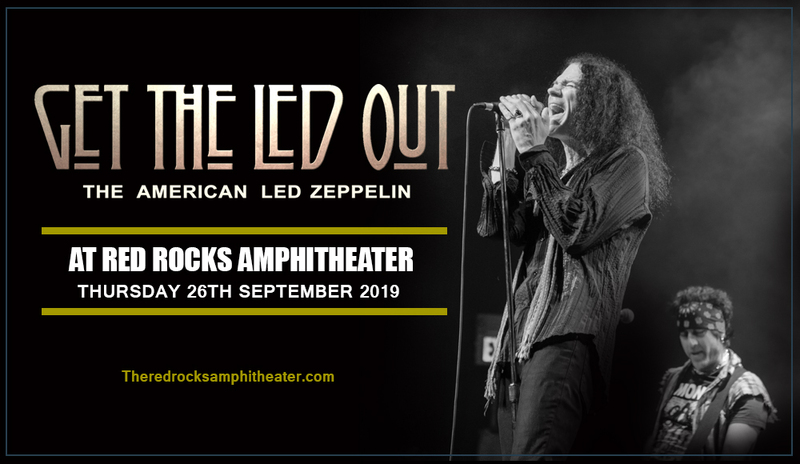 Impersonators may just look the part; cover and tribute bands may just sound like them…but when Get The Led Out hits the stage, the spirit and the essence of Led Zeppelin takes over. The studio-recorded music comes alive. Get the Led Out has been carrying the torch to keep the music of Led Zeppelin burning in the hearts and minds of generations of music lovers. The band is currently on the road these days and they're bound to shake things up here at the Red Rocks Amphitheater on Thursday 26th September 2019. Tribute bands are a dime a dozen. Cover bands abound. Impersonators are everywhere. So what then makes Get the Led Out stand out above the rest like a sore thumb? This band is on a unique mission. They're not about just playing Led Zeppelin songs to the letter. They are driven by a magical force to bring the legendary band's studio-recorded masterpieces to life — live on the concert stage! And this is no meager feat. Led Zeppelin has layers upon layers of sounds through the use of studio overdubs–something that even Led Zep themselves has not attempted to do. What you'll hear on the record, is what will actually unfold on the live stage. Also, they'll be performing sans the fake wigs, make-ups and fake English accents. Get the Led Out is in the business of sucking out the marrow of the music. Their quest is to bring out the essence, the depth, and the glory of the music of Led Zeppelin. Nothing less, nothing more, but sufficiently covers the breadth and depth of Led Zeppelin's legacy. Now it's time — get out there and score those tickets now!